"Wine & Spirits Magazine" has rated the wine "Masi Mazzano, Amarone della Valpolicella Classico DOCG, Italy" the vintage 2009 on 01.10.2016 with 93 of 100 points. "Wine Spectator" has rated the wine "Masi Mazzano, Amarone della Valpolicella Classico DOCG, Italy" the vintage 2009 on 31.08.2016 with 95 of 100 points. 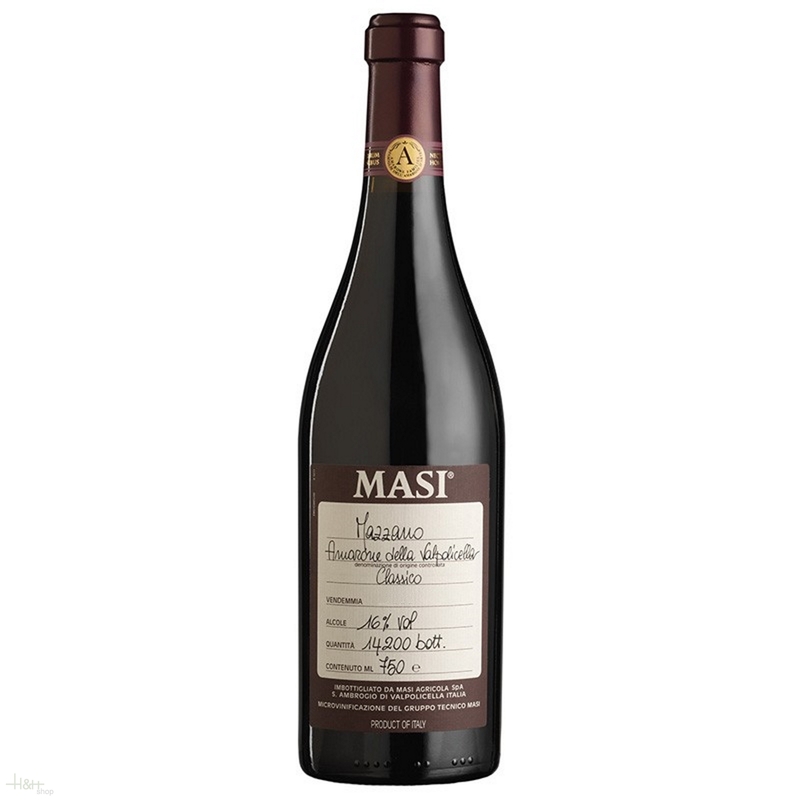 "Luca Gardini" has rated the wine "Masi Mazzano, Amarone della Valpolicella Classico DOCG, Italy" the vintage 2007 on 01.04.2015 with 89 of 100 points. "Robert Parker The Wine Advocate" has rated the wine "Masi Mazzano, Amarone della Valpolicella Classico DOCG, Italy" the vintage 2007 on 30.12.2014 with 96 of 100 points. "Wine & Spirits Magazine" has rated the wine "Masi Mazzano, Amarone della Valpolicella Classico DOCG, Italy" the vintage 2007 on 01.08.2014 with 91 of 100 points. "Wine Spectator" has rated the wine "Masi Mazzano, Amarone della Valpolicella Classico DOCG, Italy" the vintage 2007 on 31.05.2014 with 94 of 100 points. "Wine Enthusiast" has rated the wine "Masi Mazzano, Amarone della Valpolicella Classico DOCG, Italy" the vintage 2007 on 12.01.2014 with 92 of 100 points. "Robert Parker The Wine Advocate" has rated the wine "Masi Mazzano, Amarone della Valpolicella Classico DOCG, Italy" the vintage 2004 on 31.10.2013 with 95 of 100 points. "Wine Spectator" has rated the wine "Masi Mazzano, Amarone della Valpolicella Classico DOCG, Italy" the vintage 2006 on 30.06.2013 with 94 of 100 points. "Wine Enthusiast" has rated the wine "Masi Mazzano, Amarone della Valpolicella Classico DOCG, Italy" the vintage 2006 on 11.01.2013 with 93 of 100 points. "Wine Enthusiast" has rated the wine "Masi Mazzano, Amarone della Valpolicella Classico DOCG, Italy" the vintage 2003 on 11.01.2012 with 96 of 100 points. "Luca Gardini" has rated the wine "Masi Mazzano, Amarone della Valpolicella Classico DOCG, Italy" the vintage 1983 on 01.12.2011 with 95 of 100 points. "Luca Gardini" has rated the wine "Masi Mazzano, Amarone della Valpolicella Classico DOCG, Italy" the vintage 1995 on 01.12.2011 with 91 of 100 points. "Luca Gardini" has rated the wine "Masi Mazzano, Amarone della Valpolicella Classico DOCG, Italy" the vintage 1988 on 01.12.2011 with 91 of 100 points. "Luca Gardini" has rated the wine "Masi Mazzano, Amarone della Valpolicella Classico DOCG, Italy" the vintage 1979 on 01.12.2011 with 89 of 100 points. "Luca Gardini" has rated the wine "Masi Mazzano, Amarone della Valpolicella Classico DOCG, Italy" the vintage 1997 on 01.12.2011 with 89 of 100 points. "Luca Gardini" has rated the wine "Masi Mazzano, Amarone della Valpolicella Classico DOCG, Italy" the vintage 1973 on 01.12.2011 with 86 of 100 points. "Luca Gardini" has rated the wine "Masi Mazzano, Amarone della Valpolicella Classico DOCG, Italy" the vintage 1967 on 01.12.2011 with 85 of 100 points. "Wine Spectator" has rated the wine "Masi Mazzano, Amarone della Valpolicella Classico DOCG, Italy" the vintage 2004 on 31.10.2011 with 94 of 100 points. "Wine Enthusiast" has rated the wine "Masi Mazzano, Amarone della Valpolicella Classico DOCG, Italy" the vintage 2004 on 12.01.2011 with 95 of 100 points. "Vinum Wine Magazine" has rated the wine "Masi Mazzano, Amarone della Valpolicella Classico DOCG, Italy" the vintage 2004 on 01.12.2010 with 17 of 20 points. "Wine Spectator" has rated the wine "Masi Mazzano, Amarone della Valpolicella Classico DOCG, Italy" the vintage 2003 on 28.02.2009 with 93 of 100 points. "Wine Spectator" has rated the wine "Masi Mazzano, Amarone della Valpolicella Classico DOCG, Italy" the vintage 2001 on 30.04.2008 with 91 of 100 points.